Coal companies are making Europeans sick. The coal that they burn has serious and very well known impacts on human health. There are 103 companies that still operate coal power plants in the EU. For the first time, this report models every company’s impact from their coal power plants on the air we breathe, and how that adversely impacts people’s health. Using the most recent, officially reported coal power plant pollution data from 2016, this report applies state-of-the-art atmospheric modelling and methodologies to estimate the impact of these coal power plants on human health. Coal-fired electricity in Europe is in terminal decline. Wind and solar are taking over and making coal plants redundant, but the speed of change remains important. Many companies still have no plans to retire their coal plants. Those coal companies bear a significant responsibility for the health impact they have caused and are causing; decision makers have a duty to hold them accountable on behalf of their citizens. Committing to an ambitious and just transition away from coal by 2030 or earlier is the only way these companies and governments can begin to address the consequences of operating coal power plants. 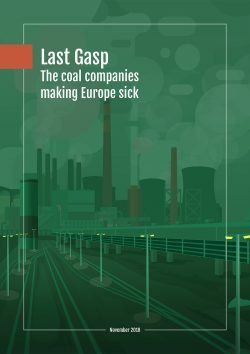 Following on from the Last Gasp, Europe Beyond Coal partners HEAL, Bankwatch and Climate Action Network released Chronic Coal Pollution, a new report that explores the impact of coal pollution on health in the Western Balkans. It emphasises the prognosis of EU action to improve health and economies across Europe.